Volunteers form the core of our village effort. Our Service Volunteers work directly with members to provide support. Volunteers are able to tell us what days and times they are available, and which types of tasks they would like to assist with. When a request for assistance is made, you will be notified by email if it is within your availability and preferred scope of work. When you see something you can help with, let us know! Tasks are assigned on a request by request basis. 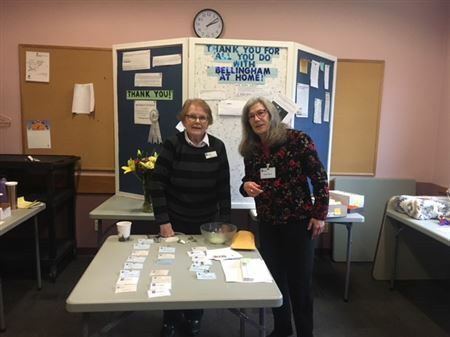 Task Force Volunteers help with the development of the many aspects of Bellingham At Home, including recruiting more Volunteers! Office Volunteers perform the tasks of running the office and matching service volunteers with member requests. Volunteers are needed to provide assistance to our members, including such tasks as providing transportation for shopping and medical appointments; light housekeeping, assistance with household maintenance tasks, help with gardening and lawn mowing; and companionship during social activities including home visits, exercise partners and community events. Volunteers are needed to run the Bellingham At Home office. They answer in person and phone inquiries, record members' requests, and contact volunteers. Basic computer skills and a friendly attitude are a must! Office tasks include operating the Club Express "back office" software, answering phone calls and email, maintaining the office records, handling financial transactions, and training new office volunteers. Office shifts are 3.5 hours and regularly scheduled Monday - Friday between 9am and 4pm. For all types of volunteering, please fill out the Volunteer Application and return it to Bellingham At Home. You can email the form to info@bellinghamathome.org, or you can print it and send or deliver it to Bellingham At Home, 315 Halleck Street, Bellingham, WA 98225.